Being a spinner I’m quite happy knitting with hand spun yarn but the world of hand spun can seem a bit daunting especially to those new to knitting. 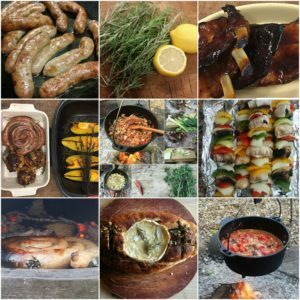 I think for most knitters part of the reason for knitting is to make something special and different to mass produced, shop bought things and what could be more special and less mass produced than hand spun yarn. 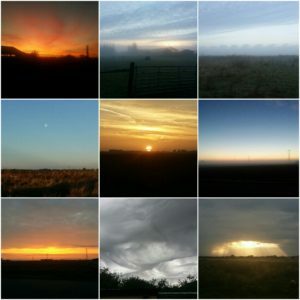 It’s true that hand spun yarns don’t usually come with all the details you get on the label of commercial yarns but it’s easy enough to work out what you need to know. 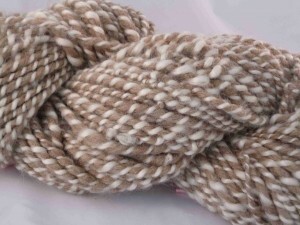 It’s also true that there is usually some variability in hand spun yarn but that’s what makes it and your knitting unique. 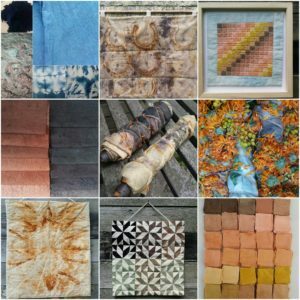 To get the best out of your hand spun yarn you need to take the time to consider its individual characteristics. What does the yarn feel like ? will it suit being next to your skin? will it stand up to regular washing or does it need a gentle handwash? 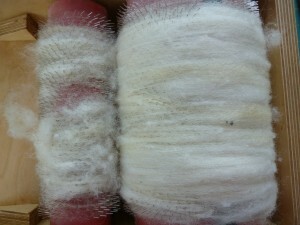 Yarns can be spun in different ways to create yarns that are smooth, lustrous, fuzzy, light and fluffy. A fuzzy yarn is likely to get even fuzzier over time which will lead to a less well defined stitch pattern. 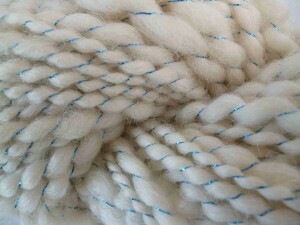 Woolen yarns have a softer look compared to a smoother worsted yarn. 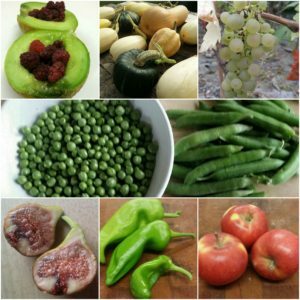 So consider these points when thinking about which projects to use your hand spun in. The number of plies in a yarn will also have a big impact on the look of your finished project. Three ply yarns will have much greater stitch definition but being quite round will tend to fill in the holes in a lacy knit. Strength of yarn is also affected by the number of plies, the more there are the stronger the yarn. 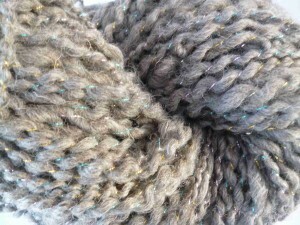 Lots of hand spun yarns are fat singles. A fat single is a single yarn that hasn’t been plied with another single to create e.g. a double ply. Of course because it is a single the yarn won’t be as strong as a plied yarn but that doesn’t mean you can’t do a lot with it. Straight off the spinning wheel fat singles turn into a curly, twirly mess, they’re usually described as having a lot of energy. The reason for this is that there only twist in one direction. 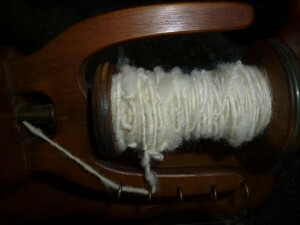 With a double ply yarn two fat singles are spun the opposite way when plied together, reducing the energy in the twist. It’s really easy to tone down the energy / twist in a fat single though, you just need to give it a nice hot soak after spinning. 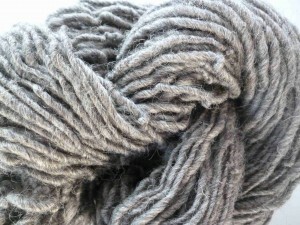 I wash all my hand spun yarns after spinning but if you have a yarn that you’re not certain has been washed just dunk it some hot water for a bit of a soak. Commercial yarns will generally have a description of the yarn thickness as well a weight in grams and perhaps a guide to length / yardage. 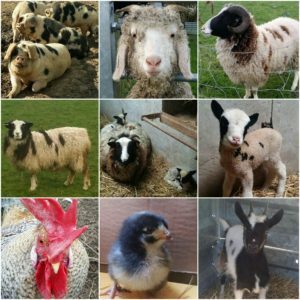 Some hand spun yarns might come with some,all or none of this information but it’s easy to work out yourself. Quite often you will see the wraps per inch (w.p.i) for a hand spun yarn. This is a very simple measure to indicate the thickness of the yarn. To calculate wraps per inch simply wind the yarn around a ruler over an inch and work out how many wraps there are per inch. Here’s a rough guide to w.p.i, type of yarn and stitches per inch. 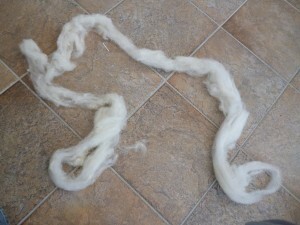 Often you will get an approximate weight for hand spun but you can weigh it yourself on the kitchen scales. To work out the length of your yarn you can weigh specific length e.g. 1metre and then calculate the length of the remaining yarn e.g. if 1m of yarn weighs 2grams then 100grams of yarn is about 50metres long. You can also buy yarn calculators (they have some on amazon) that will tell you the length of your yarn. 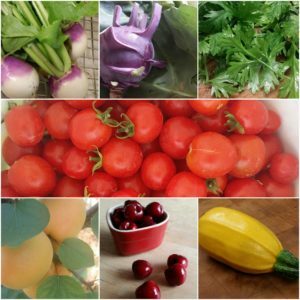 So, once you’ve found out about your yarn characteristics what can you use it for ? the simple answer is anything if you have enough of it. But if you’ve only got a small amount why not use your hand spun yarn together with a commercial yarn to add a bit of an extra special something to your project. Use your hand spun yarn as an accent, as an edging or for a specific part of a pattern. 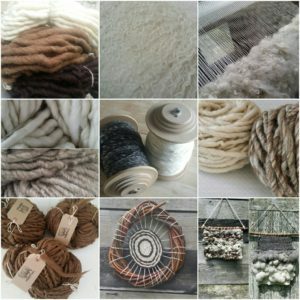 If you want to use hand spun yarn for an entire project here’s a rough guide to how much you might need. With all the spinning I’ve been doing I’m getting through my rovings and wool batts that I bought on ebay pretty quickly. So today I decided to process a fleece that I had already washed, I’ll be processing all the fleeces from our flock of Jacob sheep in the next few weeks so needed to get some practice. I washed the fleece a month or so ago and had stored it in a pillowcase. 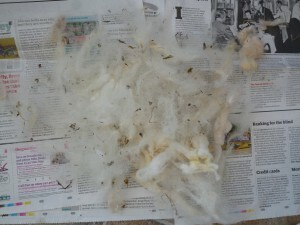 The first step was to pick through the fleece and remove all the bits of twig and grass that remained after washing. The easiest way to do this is to sit with the unpicked fleece on one side of you, a piece of newspaper between your feet and something to put the picked fleece in on your other side. You can use hand carders to prepare your fleece but it takes a lot of elbow grease so I’ve bought a drum carder which makes the process a bit faster and less labour intensive. 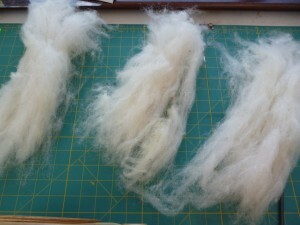 The point of carding is to get the fibres in the wool lying in the same direction. 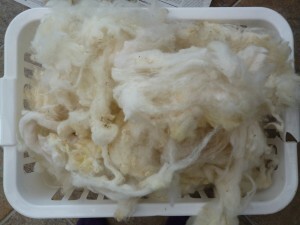 The fleece is fed in gradually to the smaller cylinder and then picked up and combed by the larger cylinder. 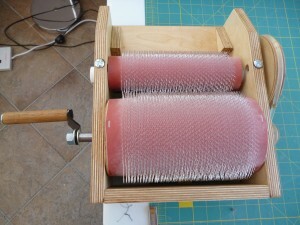 The drum carder came with a doffer pin to lever the carded wool batt off the drum carder. It’s a bit like a blunt knitting needle with a wooden handle. The drum carder is very easy to operate but I got quite impatient and fed too much wool in too quickly so I got a fair bit stuck on the smaller cylinder. It was easy enough to get off though. 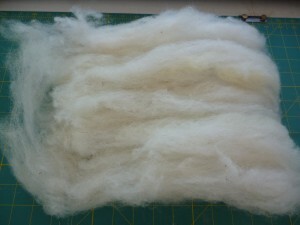 Once the wool has been passed though the carder it is a wool batt. The batt is then separated into smaller batts just by pulling the wool apart and then each of these is passed though the drum carder another two or more times until you’re happy with it. Here’s a batt and a batt separated. 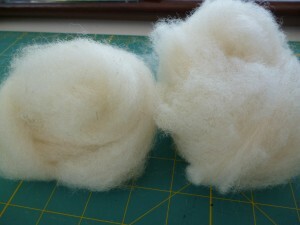 The wool really is lovely and fluffy once it’s gone through the carder. You could store the batt as it is but I decided to pull mine into a long strip or sliver and then wrap it into a ball.